Sometimes I figure out the weak spot in my articles based on the emails and comments they receive. One popular article we did was all about Stephen Hawking’s realization that black holes must evaporate over vast periods of time. We talked about the mechanism, and mentioned how there are these virtual particles that pop in and out of existence. Normally these particles self annihilate, but at the edge of a black hole’s event horizon, one particle falls in, while another is free to wander the cosmos. Since you can’t create particles from nothing, the black hole needs to sacrifice a little bit of itself to buy this newly formed particle’s freedom. But my short article wasn’t enough to clarify exactly what virtual particles are. Clearly, you all wanted more information. What are they? How are they detected? What does this mean for black holes? In situations like this, when I know the actual Physics Police are watching, I like to call in a ringer. Once again, I’m going to go back and talk to my good friend, and actual working astrophysicist, Dr. Paul Matt Sutter. He has written papers on subjects like the Bayesian Analysis of Cosmic Dawn and MHD Simulations of Magnetic Outflows. He really knows his stuff. Hey Paul, first question: What are virtual particles? Alright. No pressure, Fraser. Okay, okay. To get the concept of virtual particles you actually have to take a step back and think about the field, especially the electromagnetic field. In our current view of how the universe works all of space and time is filled up with this kind of background field. And this field can wibble and wabble around, and sometimes these wibbles and wabbles are like waves that propagate forward, and we call these waves photons or electromagnetic radiation, but sometimes it can just sit there and you know bloop bloop bloop, just you know pop fizzle in and out, or up and down, and kind of boil a little all on its own. In fact all the time space is kind of wibbling/wabbling around this field even in a vacuum. A vacuum isn’t the absence of everything. The vacuum is just where this field is in its lowest energy state. But even though it’s in that lowest energy state, even though maybe on average there is nothing there. There’s nothing stopping it from just bloop bloop bloop you know bubbling around. So actually the vacuum is kind of boiling with these fields. In particular the electromagnetic field which is what we are talking about right now. And we know that photons, that light, can turn into particle, anti-particle pairs. It can turn into say an electron and a positron. It can just do this. It can happen to normal photons, and it can happen to these kind of temporary wibbly wobbly photons. So sometimes a photon or sometimes the electromagnetic field can propagate from one place to another, and we call it a photon. And that photon can split off into a positron and an electron, and other times it can just wibble wobble kind of in place and then wibble wobble POP POP. It pops into a positron and an electron and then they crash into each other or whatever, and they just simmer back down. So, wibble wobble, pop pop, fizz fizz is kind of what’s going on in the vacuum all they time, and that’s the name we give these virtual particles are just the normal kind of background fuzz or background static to the vacuum. Okay. So how do we see evidence for virtual particles? Yeah, great question. We know that the vacuum has an energy associated with it. We know that these virtual particles are always fizzing in and out of existence for a few reasons. Another thing is called the Lamb Shift, and this is when the wibbly wobbly electromagnetic field or the virtual particles interact again with electrons in say a hydrogen atom. It can gently nudge them around, and this shift effects some states of the electron and not other states. And there are actually states that you would say have the exact same say energy properties, they are just kind of identical, but because the Lamb Shift, because of this wibbly wobbly electromagnetic field interacts with one of those states and not the other, it actually subtly changes the energy levels of those states even though you’d expect them to be completely the same. And another piece of evidence is in photon photon scattering usually two photons just, phweeet, fly by each other. They are electrically neutral, so they have no reason to interact, but sometimes the photons can wibble wobble into say electron/positron pairs, and that electron/positron pair can interact with the other photons. So sometimes they bounce off each other. It’s super rare because you have to wait for the wibble wobble to happen at just the right time, but it can happen. So how do they interact with black holes? Alright, this is the heart of the matter. What do all of these virtual particles or wibbly wobbly electromagnetic fields have to do with black holes, and specifically Hawking radiation? But check this out. Hawkings original formulation of this idea that black holes can radiate and lose mass actually has nothing to do with virtual particles. Or it doesn’t speak directly about virtual particle pairs, and in fact no other formulations or more modern conceptions of this process talk about virtual particle pairs. Instead, they talk more about the field itself and specifically what’s happening to the field before the black hole is there, what’s happening to it as the black hole forms, and then what happens to the field after it’s formed. And it kind of asks a question: What happens to these wibbly wobbly bits of the field, these like transient kind of boiling nature of the vacuum of the electromagnetic field? What happens to it as that black hole is forming? Well what happens is that some of the wibbly wobbly bits just get caught near the black hole, near the event horizon as it is forming, and they spend a long time there, and eventually they do escape. So it takes awhile, but when they escape because of the intense curvature there, the intense curvature of space-time, they can get boosted or promoted. So instead of being temporarily wibbly wobbly’s, in the field they get boosted to become “real” particles or “real” photons. So it’s really like an interaction of the formation of the black hole itself with the wibbly wobbly background field, that eventually escapes because it’s not quite trapped by the black hole. Eventually it escapes and gets turned into real particles, and you can calculate like what happens with say the expected number of particles near the event horizon of the black hole. The answer is the negative number, which means the black hole is losing mass and spitting out particles. Now this popular conception of virtual particle pairs popping into existence and one getting caught inside the event horizon. That’s is not exactly tied to the mathematics of Hawking radiation but it’s not exactly wrong either. Remember the wibbly wobbly’s in the electromagnetic field are related to these pairs of particles and anti-particles that are constantly popping in and out of existence. They kind of go hand in hand. So by talking about wibbly wobbly’s in the field you’re also kind of talking about the production of virtual particles. And it’s not exactly the math, but you know close enough. Okay, and finally, Paul. I need you to just randomly blow the minds of the viewers. 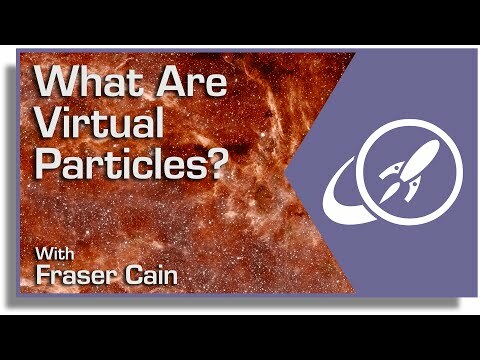 Something about virtual particles that is just amazing! Alright. So you want to bend people’s minds? All right. I was saving this for the last. Something juicy, just for you, Fraser. Check this out, it’s one other big piece of evidence we have for the existence of these background fluctuations and the existence of virtual particles, and that’s something we call the Casimir Effect, or Casimir Force. You take two neutral metal plates, and what happens is this field that permeates all of space-time is inside the plates and it’s outside the plates. Inside the plates, you can only have certain wavelengths of modes. Almost like the inside of a trumpet can only have certain modes that make sound. The ends of the wavelengths must connect to the plates, because that’s what metal plates do to electromagnetic fields. Outside the plates you can have any wavelength you want. It doesn’t matter. So it means outside the plates you have an infinite number of possible wavelengths of modes. Every kind of possible kind of fluctuation, wibble wabble in the electromagnetic field is there, but inside the plates it’s only certain wavelengths that can fit inside the plates. Now, outside there’s an infinite number of modes. Inside, there is still an infinite number of modes, just slightly fewer infinite number of modes. And you can take the infinity on the outside, and subtract the infinite infinity on the inside, and actually get a finite number, and what you end up with is a pressure or a force that brings the plates together. And we have actually measured this. This is a real thing, and yes, I am not kidding around, you can take infinity minus a different infinity, and get a finite number. It’s possible. One example is the Euler Mascheroni Constant. I dare you to look it up! So there you go, now I hope you understand what these virtual particles are, how they’re detected, and how they contribute to the evaporation of a black hole. And if you haven’t already, make sure you click here and go to his channel. You’ll find dozens of videos answering equally mind-bending questions. In fact, send your questions and he might just make a video and answer them. Nice topic and well-timed. The first GW (Gravity Wave) event may have had a gamma ray burst result from the merger, though this is in question. Yet annihilations of neutrinos and antineutrinos purportedly lead to gamma-ray bursts. So what does a wibbly wobbly of an EH (event horizon), caused by the merger of black holes, do to the virtual wibbly wobblies? The EH shrunk by ~ 9 km (first merger recorded) very quickly, releasing perhaps gamma rays??? Fun stuff just imagining! So… where does all this tie in to all the angry physicists who keep shouting at me that “virtual particles are a purely mathematical tool and have no physical reality!”? Basically, the process is exploiting the strong curvature the black hole causes for the energy to produce particles, transforming a bit of its gravitational field into mass.